A 64-bit version is included in the download. If you're not sure, launch the 32-bit. Display clearer message when prompting for upgrade from FoldersPopup to Quick Access Popup (prompt displayed only for QAP releases with new features). Add the auto-detection of .ahk and .vbs extensions when user add a favorite using drag-and-drop to the Settings window. Stop launching Directory Opus when refreshing the list of open folders in listers if Directory Opus is not running. French, Sweeden and German language files update. New runtime v1.1.23.5 from AHK. I use windows xp sp 3 and I use the classic view and classic windows mapping in the folder options. When I open things in a folder on the desktop using Folders Popup then the navigation pane opens too. Could you delete that function please? I mean the navigation pane on the left of the screen, I don't use it since the beginning of windows xp, because it takes space. It only happens when opening clicking on an empty space on the desktop. Every time I open a folder with Folders Popup then the explorer bar open too. Could you delete that function please? I mean the explorer bar on the left of the screen in a folder, I do not use it since the beginning op windows xp, it takes space. Folders Popup doesn't work in some of the windows fileboxes in xp. Please test all possible fileboxes and you will notice that some don't work. That is also the case with other alike programs. Is it even possible to make all fileboxes work. 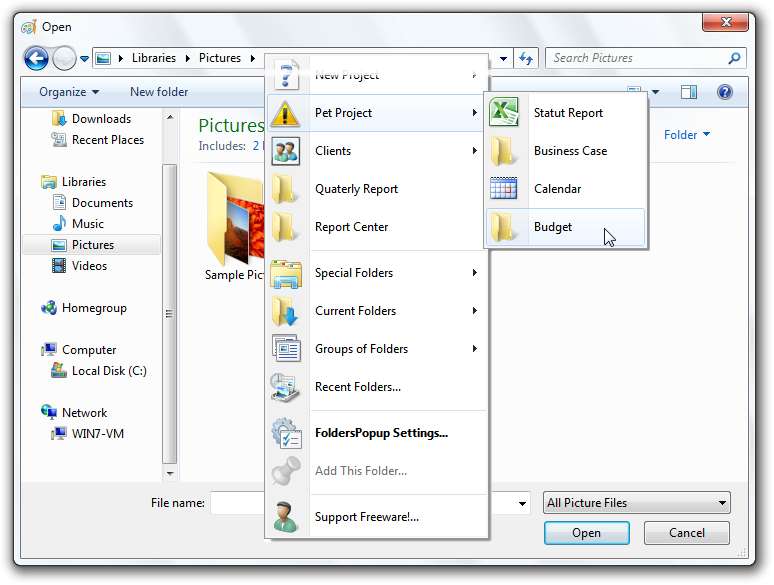 Folders Popup v5.2.3 is a maintenance release. Users looking for new features are invited to check the Folders Popup's next generation app: Quick Access Popup (http://www.portablefreeware.com/index.php?id=2765). Still free and still portable. If you have trouble downloading, just use any VPN like Betternet. I downloaded it with Betternet Chrome extension. Folders Popup users based on Windows 7+ systems are invited to give a try to Quick Access Popup (http://www.portablefreeware.com/index.php?id=2765), the next generation of Folders Popup. As with Folders Popup, you will continue to save thousands of clicks while browsing your favorite folders in Windows Explorer or file dialog boxes. But, in addition, you will use it to launch your most used applications, documents or web sites instantly with this easy popup menu and mouse/keyboard shortcuts manager. Gather related favorites in submenus. Assign favorites to keyboard or mouse shortcuts. Group favorites and launch then in one click. Switch to any open window or reopen in dialog boxes folders open in Explorer. Folders Popup and Quick Access Popup should be listed as separate applications as FP will continue to be supported for Windowx XP/Vista users as a distinct app (with its own version numbering). One thing I don't like about LB is that you can't click folder links directly in the recursive menus, only files, which means making a right-click and left click instead of only one left-click. 2. Add ability to hide the bottom contents of the menu (eg, folder groups, copy path, etc). Obviously the support freeware link can stay there, but I feel that the other stuff takes too much real estate, especially when they're not used very often. Perhaps they can also be put into their own submenu, by user choice. Great little program, although i don't use it every day, it comes in very handy every once in a while. But.. i have to agree with the previous 2 commenters, if you ask for anything in return, either donation or an act (writing this review) can not be called freeware. "But the price to pay, then, is to tolerate this little annoyance." Freeware is free because it has no price- it is free. Yours is not freeware but donationware/nagware masked as freeware. So your 'Support Freeware! nag has nothing to do with freeware since your FoldersPopup is not freeware but begware/donationware/nagware. I always decide myself whether I want to support a developer and how. But I do not tolerate beggars and their nags so I never donate to those who beg for money blatantly and indiscreetly. I hope one day more developers will understand how low and vile it is to constantly beg for money. Hi toitoy. I'm the FP author. Thank you for your good words about the app. About the "Support Freeware" item, there is an easy way to remove this menu item: any donation will work. There is no obligation and you can still benefit from 100% of the features resulting of this development effort. But the price to pay, then, is to tolerate this little annoyance. Best regards. Very nice minimal app, but the "Support Freeware" phrase on every window is a bit to much. It becomes very annoying soon. There must be an option to remove it from pop-up menu. FoldersPopup 5.1.1 has been released. @Midas: Noted. Please use this post http://www.portablefreeware.com/forums/viewtopic.php?f=8&t=21648 or the app's support page. Question: How can I submit more recent screen capture for this page? > Win 8.1 x64: only working middle mouse button: Shift + middle mouse button do the same. Do you mean that Middle Mouse is not opening the folder in the current window but only in a new window (as would do Shift+Middle button)? v3 is adding document support. Why not supporting executable! This is added to the wish-list. Win 8.1 x64: only working middle mouse button: Shift + middle mouse button do the same. Haven't seen these comments since January. Sorry about that. @avi-aryan: Thanks for the suggestion. I implemented another solution but I'll look at this approach. Since the user can configure its hotkeys, I'll have to look how to do that with Virtual Keys. @JnLlnd You should use Virtual Keys instead of alphabets..
Error: "k" is not a valid key name. If you are rank R0 you don't have this trash can icon. Usually we delete only spam comments. As far as I am concerned, as a moderator(? ), you could delete these now irrelevant comments. Thanks. Nope. tassman should clear the browser cache and retry. Sorry. Still nothing. Send it please to me both version tassman[at]gmail.com I put it in google drive and resend you links (if you want of course).